And so we come at last to the final volume in the remarkable journey that is The Long Earth. It also happens to be the swansong of that singular author Sir Terry Pratchett. And what a finale it is. The Long Cosmos lives up to the promise the authors have been building with this series, it is quite simply breath-taking. A vision that goes far beyond the boundries that the Long Earth already presented us with and far our into an endless multitude of space. I've been waiting to read this book for some time, and yet reading it also brings about a sadness. Pratchett is one of my favourite authors, his works have made me laugh and think more than any other author alive or dead. He is a man I admire more than most and it would be impossible not to be moved by reading what is likely his final published work. 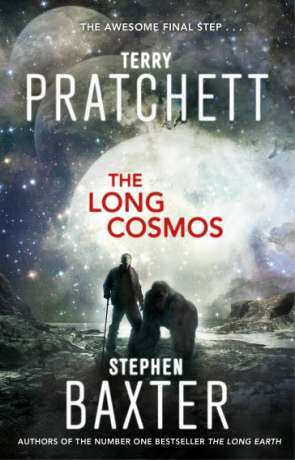 The Long Cosmos was mostly written some 18 months ago and credit has to go to the supremely talented Stephen Baxter who has polished the prose and finished crossing the t's. Before I mention the book itself I would start by saying that I wouldn't attempt to read The Long Cosmos before reading the previous four books. While the series span's over seventy years it does feature a number of the same characters and the larger story arc flows through all five books. The Long Cosmos begins almost 60 years after "step day", the day that mankind discovered the ability to step into countless parrallel Earth's, all devoud of humanities mark. As Joshua Valienté embarks upon an adventure into a remote wilderness a signal is received from the stars with a simple message "JOIN US". No-one knows who or even where this signal has come from but those clever next-generation humans have figured out there is a rather special set of instructions placed within the message, instructions on how to build an advanced AI. So the story follows the investigation of this message along with the personal journeys of characters including Joshua and of course my personal favourite, Lobsang - not to mention a highly gifted Troll. It's a story about our race, our understanding of the world around us and the space outside but more importantly it's a story about relationships. It's about the need to understand those you love and not to judge them unless you've walked in their shoes. It's also about acceptance. Accepting who you are and accepting those who are different, who lead different lives or have different beliefs. There is a wonderful feeling of positivity about our future, about the survival of the human race, not to mention our place in the Universe and how little we really understand it. I love the sense of scope the series imparts, a story that stretches decades, millions of worlds and a potentially unlimited cacophony of stars. Grand doesn't begin to do this series justice. The balance between the jovial warmth of Pratchett's voice and the fierce intelligence of Baxter's is perfect - a merging of talent that could not be bettered. As you might expect with this being the final book in the series, there is a positive sense of completeness about it which includes a finale that is perfectly played - not so much an ending but more just an end to our view of this incredible multiverse. I often wondered what it would be like if Pratchett turned his mind to writing science fiction and now we know. Combined with the brilliance of Baxter it is simply sensational. Clever, thoughtful, rewardingly positive fiction that gives us hope four our future and the future of our childrens children. A wonderful, exceptional exploration that moves you, makes you think and above, all, at the end, makes you smile. Written on 4th July 2016 by Ant.